The Columbia River Gorge is the roughly 90-mile-long canyon through the Cascade Mountains, the only place in the entire range, which stretches from British Columbia to California, where the mountains are split at near sea level. Here the river forms the border between Washington on the north side and Oregon on the south. The eastern Gorge is in the rain shadow of the Cascades, where annual rainfall is just 14 inches at The Dalles, Oregon. The central and western Gorge, from the mouth of the Wind River, Washington, to a few miles beyond Cascade Locks, Oregon, is in the center of the mountains, where they catch frequent weather systems that move in from the Pacific Ocean. One hundred inches of rain in a year is not unusual. The unique climate and geography of the Gorge have produced a unique and diverse plant community. Botanists have cataloged 31 plant species at elevations below 1,600 feet in the cool and shady south wall and canyons of the Gorge that usually occur only above 4,000 feet. Nine species of plants are found only in the Gorge. Geologically, the Gorge dates to the Miocene era (12-17 million years ago) and the Pleistocene era (700,000-2 million years ago), when the Cascades formed in a series of volcanic eruptions. At the time, the river entered the Pacific 100 miles or so to the south of its present course, but as the mountains and surrounding areas rose, the river found a new course to the sea and slowly eroded the Gorge. At the end of the last Ice Age about 14,000-20,000 years ago, floods cut the remarkable, steep-walled canyon of the modern Gorge, exposing multiple layers of lava — 21 flows had poured through the Gorge during the Miocene era. In mythology, the creation of the Gorge was the work of Coyote, who fought a great battle with the beaver god Wishpoosh (see: Columbia River). As the two fought, Coyote backed Wishpoosh steadily west; the beaver’s great tail slashed at the mountains as he fought and carved the river’s passage to the sea. Lewis and Clark journeyed down the Gorge in 1805 and generally are considered the first Euro-Americans to see it, although their journals mention an encounter in the Gorge with a red-haired Indian who said his father was a Spaniard who survived a shipwreck on the coast. Lewis and Clark described the Gorge in detail and named some of its prominent features, including Beacon Rock. They encountered and described Indians and Indian villages and fishing camps along the way. Naturalists including David Douglas and John Townsend later spent time in the Gorge documenting the plant life and, in Townsend’s case, birds. Methodist missionaries Jason and Daniel Lee built their Wascopam mission at The Dalles in 1838. The mission buildings are believed to be the first built by non-Indians in the Gorge. The Gorge was a challenge for Oregon pioneers, who often transferred their belongings and wagons to barges at The Dalles for the trip to Oregon City, but had to portage past the falls of the Cascades in the area of present-day Cascade Locks. The portage, a trail along the north shore about five miles long, was particularly difficult and remained so until Justin Chenowith completed his portage “railway” on the north bank in 1851. It consisted of a cart that ran on wooden rails and was pulled by a mule. Later, a competing portage railway was built on the south shore. The Union Pacific completed its rail line through the Gorge in 1884, on the south shore, opening a transcontinental link between Portland and the Midwest by linking its subsidiary Oregon Short Line Railway to the Oregon Railway and Navigation Company line at Huntington, Oregon. The previous year, 1883, the Northern Pacific Railway had completed its transcontinental line from the Midwest to Seattle and Tacoma, and on to Portland using a ferry crossing at Kalama, Washington. A subsidiary of the Northern Pacific and Great Northern railways, the Spokane, Portland & Seattle Railway, was completed through the Columbia River Gorge on the north shore, but not until 1908. The coming of the railroads spurred settlement and development in the Gorge, where the timber and agriculture industries soon flourished. 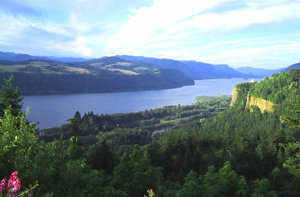 The area of the middle Gorge, around Hood River, Oregon, long has been known for its tree fruit industry, particularly apples. Apple cultivation began in the area in the 1850s. Canneries also located in the Gorge to harvest — and at times overharvest— the abundant salmon and steelhead. Today the Gorge is a major transportation corridor, with Interstate 84 and the Union Pacific Railroad tracks on the south shore. Parts of Lancaster’s Columbia River Highway are here, too, and provide a curvy, scenic option to the freeway. Washington Highway 14 and the Burlington Northern tracks are on the north shore. Bonneville Dam is five miles west of Cascade Locks at the western end of the Gorge, and The Dalles Dam is at the eastern end. Thirteen cities are within the Gorge; most began as steamboat landings in the late 1800s and early 1900s. Stevenson and White Salmon, Washington, and Hood River and The Dalles, Oregon, are the largest. Long dependent on extractive industries for economic development, particularly logging in the national forests that stretch away from both shores, Gorge communities responded to the reduced timber harvests in the 1980s and ‘90s by switching to a tourism-based economy. The wind-tunnel attribute of the Gorge makes it one of the world’s finest venues for wind-surfing, and communities, particularly Hood River, have capitalized on the popularity of the sport. On windy days in the spring and summer literally hundreds of colorful sails dot the gray-green waters and the wave-top whitecaps of the river. The scenic beauty of the Gorge is being preserved through federal legislation. In 1986, Congress created the Columbia River Gorge National Scenic Area. The Area encompasses an 85-mile stretch of the Gorge from the Sandy River on the west to the Deschutes River on the east in Oregon and from Gibbons Creek in Clark County to a line four miles east of Wishram in Washington. The Scenic Area includes portions of six counties, three in each state. The federal legislation is intended to protect and enhance the scenic, natural, cultural and recreational resources of the Gorge while also encouraging compatible growth within existing urban areas and allowing economic development outside urban areas consistent with resource protection. The law authorized the two states to appoint a Columbia River Gorge Commission and directed the commission to develop a management plan. The plan was completed in 1991. The six Gorge counties implement the management plan through land-use ordinances. Columbia Gorge looking east, past Crown Point on the right. Photo: Stephen Sasser.